euroclub | ESCKAZ.com live from Lisbon! Another tradition Eurovision location is Euroclub, which opened last night at 11pm (Lisbon time). It’s located at Praça do Comércio in Millennium club. Euroclub this year have two different spots: terrace and 2-leveled dance floor. This year’s Euroclub is three-times smaller than last year’s but this one looks more like a club, and not like exhibition centre. Yesterday I also went to the Euroclub opening and while a larger review and all the videos/photos are already posted, just a few words from me to add! Luckily the programme didn't start until after 10 so I still got to see Sunstroke Project and O.Torvald perform. The drink menu was already mentioned. 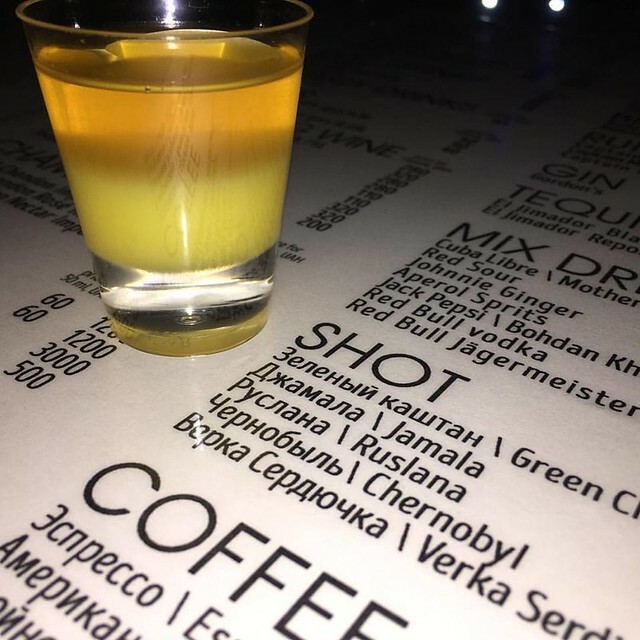 I decided to try one of the special shots, with the name Jamala. So I got to taste a winning recipe obviously. Still didn't really see what it is so I can't help those who were looking for the recipe for success! So the club?? Well it’s not as big as in previous years, but has a huge stage and seems to have various rooms upstairs and another room to the side. We didn’t venture in there too much as there were only about 350 people there….I know it's early days yet!! Well the Party. First a huge thanks to Fotis from Oikotimes who invited personally the whole of the ESCKAZ team. Sadly Andy could not make it, he had too much work to do, but the rest of the team were all there. And another thanks for the glass (well nearly a whole bottle in the end) of champagne….much appreciated!!!! We also managed to chat to several other delegations too, Montenegro, Lithuania, Estonia, Latvia, San Marino, and a great chat with one of the Swedish songwriters Sandra Bjurman who co-wrote Running Scared, the winning song from 2011 for Azerbaijan. Maybe this for me was one of the most interesting chats to have all night, talking about the great relationship between Swedish music and the rest of the world of pop!!! So that was it, first party of the season. Was just a perfect opener to the coming week or two and yes we were in bed by 1 am…..I know there is something wrong with us!! !